Teaching human evolution at the University of Kentucky: There are some students I’ll never reach. I teach human evolution at the University of Kentucky. There are some students I’ll never reach. This essay is adapted from a piece originally printed in the March/April 2015 issue of Orion. Request a free trial issue of Orion here. To teach evolution at the University of Kentucky is to teach at an institution steeped in the history of defending evolution education. The first effort to pass an anti-evolution law (led by William Jennings Bryan) happened in Kentucky in 1921. It proposed making the teaching of evolution illegal. The university’s president at that time, Frank McVey, saw this bill as a threat to academic freedom. Three faculty members—William Funkhouser, a zoologist; Arthur Miller, a geologist who taught evolution; and Glanville Terrell, a philosopher—joined McVey in the battle to prevent the bill from becoming law. They put their jobs on the line. Through their efforts, the anti-evolution bill was defeated by a 42­–41 vote in the state legislature. Consequently, the movement turned its attention toward Tennessee. I was originally reluctant to take my job at the university when offered it 20 years ago. It required teaching three sections of nonmajors biology classes, with 300 students per section, and as many as 1,800 students each year. I wasn’t particularly keen on lecturing to an auditorium of students whose interest in biology was questionable given that the class was a freshman requirement. Then I heard an interview with the renowned evolutionary biologist E.O. Wilson in which he addressed why, as a senior professor—and one of the most famous biologists in the world—he continued to teach nonmajors biology at Harvard. Wilson explained that nonmajors biology is the most important science class that one could teach. He felt many of the future leaders of this nation would take the class and that this was the last chance to convey to them an appreciation for biology and science. Moved by Wilson’s words, and with the knowledge that Funkhouser once held the job I was now contemplating, I accepted the position. The need to do well was unnerving, however, considering that if I failed as a teacher, a future Scopes might leave my class uninspired. We live in a nation where public acceptance of evolution is the second lowest of 34 developed countries, just ahead of Turkey. Roughly half of Americans reject some aspect of evolution, believe the Earth is less than 10,000 years old, and that humans coexisted with dinosaurs. Where I live, many believe evolution to be synonymous with atheism, and there are those who strongly feel I am teaching heresy to thousands of students. A local pastor, whom I’ve never met, wrote an article in the University Christian complaining that, not only was I teaching evolution and ignoring creationism, I was teaching it as a non-Christian, alternative religion. Some students take offense very easily. During one lecture, a student asked a question I’ve heard many times: “If we evolved from monkeys, why are there still monkeys?” My response was and is always the same: We didn’t evolve from monkeys. Humans and monkeys evolved from a common ancestor. One ancestral population evolved in one direction toward modern-day monkeys, while another evolved toward humans. The explanation clicked for most students, but not all, so I tried another. I asked the students to consider this: Catholics are the oldest Christian denomination, so if Protestants evolved from Catholics, why are there still Catholics? Some students laughed, some found it a clarifying example, and others were clearly offended. Two days later, a student walked down to the lectern after class and informed me that I was wrong about Catholics. He said Baptists were the first Christians and that this is clearly explained in the Bible. His mother told him so. I asked where this was explained in the Bible. He glared at me and said, “John the Baptist, duh!” and then walked away. The story of our evolutionary history captivates many of my students, while infuriating some. 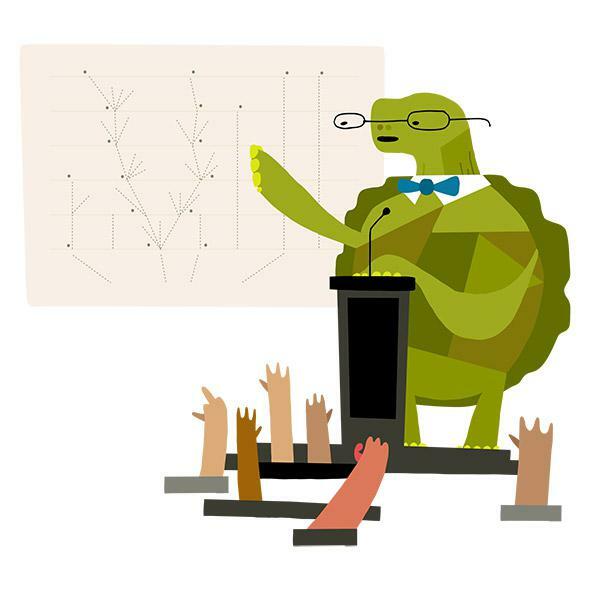 During one lecture, a student stood up in the back row and shouted the length of the auditorium that Darwin denounced evolution on his deathbed—a myth intentionally spread by creationists. The student then made it known that everything I was teaching was a lie and stomped out of the auditorium, slamming the door behind him. A few years later during the same lecture, another student also shouted out from the back row that I was lying. She said that no transitional fossil forms had ever been found—despite my having shared images of many transitional forms during the semester. Many of her fellow students were shocked by her combativeness, particularly when she stormed out, also slamming the door behind her. Most semesters, a significant number of students abruptly leave as soon as they realize the topic is human evolution. After a semester filled with evidence of evolution, one might expect that every last student would understand it and accept it as fact. Sadly, this is not the case. There are those who remain convinced that evolution is a threat to their religious beliefs. Knowing this, I feel an obligation to give my “social resistance to evolution” lecture as the final topic. This lecture lays down the history of the anti-science and anti-evolution movements, the arguments made by those opposing evolution, and why these arguments are wrong. I make it clear that one can accept evolution and maintain his or her religious beliefs. They are not mutually exclusive. In fact, 77 percent of all American Christians belong to denominations that support the teaching of evolution, and several high-profile evangelical Christians are ardent defenders of it, including former President Jimmy Carter and Dr. Francis Collins, director of the National Institutes of Health. Even Pope John Paul II acknowledged the existence of evolution in an article he published in the Quarterly Review of Biology, in which he argued that the body evolved, but the soul was created. Pope Francis has made it clear that he accepts evolution as well. This lecture should put students at ease knowing that religion and science need not be at odds. Of all the lectures I give, this one provokes the most discussion after class. Yet it often results in students expressing concern that I might not be saved. I never say anything about my personal religious beliefs, yet it is assumed I am an atheist. One student told me she hoped I could find God soon. Several simply let me know they will be praying for me and praying hard. One student explained that as a devout Catholic he had no choice but to reject evolution. He accused me of fabricating the pope’s statements. When I explained that he could go to the Vatican website for verification or call the Vatican to talk to a scientist, he insisted that there was no such information available from the Vatican. He then pointed his finger at me and said the only way he would believe me is if then–Pope John Paul II came to my class to confirm these quotes face-to-face. The student then stomped out, again slamming the auditorium door behind him. And it’s a message that sometimes gets through. There’s one student I can remember in particular who took my freshman seminar on evolutionary medicine. He was an ardent evangelical Christian who believed in the literal truth of biblical creation. The seminar was very hard on him, and he struggled with the information, questioning and doubting everything we read. Several years later, our paths crossed, and we stopped for what turned out to be a long, easy chat. Now a doctor, he explained to me that, at the time, he was so upset with my seminar that he attended a number of creationists’ public lectures for evidence I was wrong. He said he found himself embarrassed by how badly these individuals perverted Christian teachings, as well as known facts, to make their argument. He wanted me to know that he came to understand he could be a Christian and accept evolution. Then he did something that resonates with any teacher: He thanked me for opening his eyes, turning his world upside down, and blurring the line between black and white.